This page is a translated version of the page Nettuno and the translation is 100% complete. Although this is a small brand, mainly due to the commercial activities of the Vecchietti family and their historic shop in Bologna, Nettuno is certainly one of the historic names in Italian production, and its activities, of which there are traces dating back to 1911, are making it one of the oldest, if not the oldest. The Nettuno production does not particularly stands out from the rest of the Italian production, and remains substantially related to the activities of their Bologna store, but both fot the presumed collaboration with Omas, and the production quality, this brand fountain pens are of great interest to collectors. First traces of the Nettuno origin date back to 1911, date of asketch for a flyer advertising showing the brand with the Neptune fountain in Piazza Maggiore in Bologna, chosen as its symbol by Umberto Vecchietti, founder of the company. The official founding of the company, however, is later: from the archives of the Chamber of Commerce of Bologna the date is in fact 1916,  and this fact makes an excessive claim the use the title "by 1911", reported in the contemporary reissues of some of this brand models. All this would make Nettuno, after the Uhlmann's Eterno, the oldest Italian manufacturer of fountain pens, like Tibaldi, at least for what concern the foundation year. 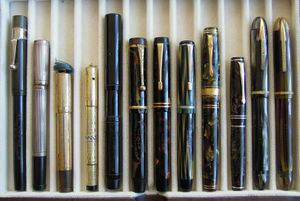 It is unclear however when the fountain pens production has actually begun. The first letterhead fact speaks for spare parts and repairs. Furthermore, at least for the first time, production was done assembling the pieces produced by others in the Umberto Vecchietti own house by his own family; therefore, this is more of a family business than a real fountain pens factory. 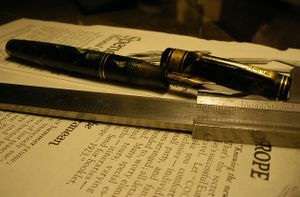 A first clear trace of fountain pens production originates to 1921, the registration date of the Penna Nettuno Sicurezza trademark (Reg. Gen. N. 21390), used for the production of pens made ​​with either eyedropper filler or safety. The initial production is in fact fairly conventional, with smooth black hard rubber pens of different sizes (502, 504, 506, 508). In addition there were overlay pens in gold-plated metal. In 1922 Umberto Vecchietti died, leaving the company in the hands of his wife, Ada Corazza Vecchietti, who brought forward the opening, in 1928, of the historic shop in Via Manzoni 6, active for 83 year and now in a new location, still run by the family. In 1930, Umberto's son, Alfonso, succeeded his mother in running the company, carried on until the 50s closing. Around the mid '20s Nettuno, like all other Italian brands, began a production of Duofold imitations, which at the time was the stylistic reference for all Italian manufacturers. In this case the button filler was also adopted, and these models, apart from the incision of the Nettuno name on the clip, are substantially identical to the Parker original model, both for the ball clip, than for the shape of the body, cap and bottom. In the 30s, continuing to follow Duofold evolution, were produced new models in streamlined version, and was also introduced a new clip with a spatula shaped termination. Approximately in 1936 was introduced the new Nettuno Superba line, with more tapered lines and multiple decorative rings, both on the hood and on the body of the pen. The first version, also characterized by a wide metal band on the cap decorated with a checkerboard pattern, was a button filler, but the pen remained in production, albeit having a series of modifications and revisions, until the 50s. At the beginning of the 40s the Nettuno Docet was introduced, a piston filler model with transparent barrel, in a single measurement. It was the joined by the Export, a low-end pen, still piston filler but produced in three sizes and different decorations. The 50s final production saw several steel nibs models, both hooded than ordinary, but always in the economy segment. In the second half of the 50s, with the gradual advent of the ballpoint pen, seeing an increasing reduction of the market, Alfonso Vecchietti decided to stop production to devote himself to the activities of his store. The brand, like many others, has recently been revived for the production of modern fountain pens. Website of Vecchietti family store, with some historical informations. ↑ at least as reported by Letizia Jacopini, in La storia della stilografica in Italia 1900-1950. This page was last edited on 30 January 2019, at 01:35.